Dave has Kayaked, Climbed, Skied, Mountaineered, SUP'd, Surfed and Coached throughout Europe, North and South America, Asia, Africa and New Zealand and has nearly 30 years experience working and playing in the Outdoors. He is a British Canoeing (BC) Level 5 White Water Kayak Coach, Level 5 Sea Coach, Level 5 Surf Kayak Coach, Grade 5 Assessor and Training Director for Coach Education and Safety Courses as well as being an Assessor Trainer. In another aspect of Paddlesport, Dave is a Senior Trainer for the Water Skills Academy, the leading provider of SUP coach education. 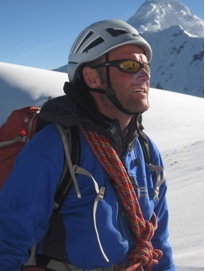 He is also an Mountain Training Scotland Winter Mountain Leader and MTUK International Mountain Leader as well as Mountain Instructor Certificate (MIC), BASI Level 2 Ski Instructor and the holder of a REC First Aid Certificate. He has managed Outdoor centres, been a Senior Instructor and worked for the National Mountain Centre, Plas Y Brenin, as well as working for the Military Adventurous Training Centres for 7 years. Dave is now basing his work from his home in North Wales were he runs his Adventure Training Consultancy - AcwaTerra. Dave is also an Appointed Internal Verifier for Welsh Triathlon. His experience in the Outdoor and Adventurous Training arena has allowed him to offer his knowledge to others as a Technical Advisor to a diverse range of organisations across UK, Europe and Asia. This service helps AALS registered centres who seek advice on risk assessments, operating procedures and technical matters for many aspects of Mountaineering, Climbing, Gorge Walking, Coasteering, Kayaking, SUP and Canoeing amongst other activities. Dave has also been involved in writing for Governing Body magazines, websites and reviewing books and equipment. In addition to his outdoor work and experience, Dave has been a keen fitness enthusiast for over 30 years, practicing and coaching Triathlon to National Development Squad Level, competing in Trampolining and Representing Wales in Surf Kayaking. He has a Sports Science Degree and a PGCE in Secondary Physical Education along with qualifications in Personal Training and Fitness Testing. Through his involvement with governing body awards, Dave has also been involved with the Committee of the Association of Mountaineering Instructors (AMI) and has conducted Continuous Professional Development workshops for Coasteering on their behalf. He is also a member of the Alpine Team of the Austrian Alpine Club Committee responsible for Climbing Activity and a member of the British Canoeing Rafting Technical Group. Dave is supported by DB Kayaks for Surf Kayaking and Rockpool Kayaks for Sea Kayaking, he is a Patagonia, Arcteryx, Black Diamond, Kokatat and Werner Paddles Pro member. He is a member of the Climbers' Club, Eagle Ski Club and Austrian Alpine Club. Sarah is an experienced and avid traveller, yogi, swimmer, runner, horse rider, skier and climber who shares a passion for the outdoors. Having spent 6 years with the RAF, she is used to 'hard work'. She can often be found teaching Yoga or re-training 'naughty' horses and apparently the naughtier they are, the better it is to work with them. ​A backbone to AcwaTerra, she keeps things running behind the scenes, whilst Dave is out on the ground running courses or visiting organisations. Guest Coaches come and join the AcwaTerra team on occasion, as do other specialists in their area. Each have their own expertise and are chosen for that reason to add to the coaching experience and your personal development.